Stephen Hawking argues that it's unremarkable that at least one planet has conditions for life. World-famous physicist makes arguments in new book "The Grand Design"
Hawking: Given existence of gravity, "universe can and will create itself from nothing"
LONDON, England (CNN) -- God did not create the universe, world-famous physicist Stephen Hawking argues in a new book that aims to banish a divine creator from physics. Hawking says in his book "The Grand Design" that, given the existence of gravity, "the universe can and will create itself from nothing," according to an excerpt published Thursday in The Times of London. "Spontaneous creation is the reason why there is something rather than nothing, why the universe exists, why we exist," he writes in the excerpt. "It is not necessary to invoke God to light the blue touch paper [fuse] and set the universe going," he writes. His book -- as the title suggests -- is an attempt to answer "the Ultimate Question of Life, the Universe, and Everything," he writes, quoting Douglas Adams' cult science fiction romp, "The Hitch-hiker's Guide to the Galaxy." It is not necessary to invoke God to light the blue touch paper [fuse] and set the universe going. His answer is "M-theory," which, he says, posits 11 space-time dimensions, "vibrating strings, ... point particles, two-dimensional membranes, three-dimensional blobs and other objects that are more difficult to picture and occupy even more dimensions of space." He doesn't explain much of that in the excerpt, which is the introduction to the book. But he says he understands the feeling of the great English scientist Isaac Newton that God did "create" and "conserve" order in the universe. It was the discovery of other solar systems outside our own, in 1992, that undercut a key idea of Newton's -- that our world was so uniquely designed to be comfortable for human life that some divine creator must have been responsible. But, Hawking argues, if there are untold numbers of planets in the galaxy, it's less remarkable that there's one with conditions for human life. And, indeed, he argues, any form of intelligent life that evolves anywhere will automatically find that it lives somewhere suitable for it. From there he introduces the idea of multiple universes, saying that if there are many universes, one will have laws of physics like ours -- and in such a universe, something not only can, but must, arise from nothing. Therefore, he concludes, there's no need for God to explain it. But some of Hawking's Cambridge colleagues said the physicist has missed the point. "The 'god' that Stephen Hawking is trying to debunk is not the creator God of the Abrahamic faiths who really is the ultimate explanation for why there is something rather than nothing," said Denis Alexander. "Hawking's god is a god-of-the-gaps used to plug present gaps in our scientific knowledge. "Science provides us with a wonderful narrative as to how [existence] may happen, but theology addresses the meaning of the narrative," said Alexander, director of The Faraday Institute for Science and Religion. And Fraser Watts, an Anglican priest and Cambridge expert in the history of science, said that it's not the existence of the universe that proves the existence of God. But, he said, "a creator God provides a reasonable and credible explanation of why there is a universe, and ... it is somewhat more likely that there is a God than that there is not. 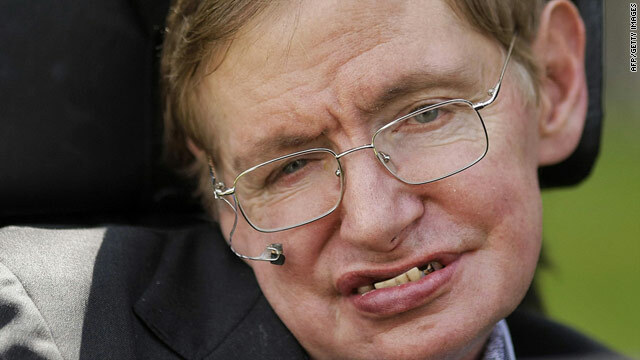 That view is not undermined by what Hawking has said." Hawking's book will be published on September 7 in the United States and September 9 in the United Kingdom.